Pokemon Go (Short For Pokemon GO) Is A Free-To-Play, Location-Based Augmented Reality Game Developed And Published By Niantic For IOS And Android Devices. It Was Initially Released In Selected Countries In July 2016.In The Game, You Could Use A Mobile Devices GPS Capability To Locate, Capture, Battle, And Train Virtual Creatures, Called Pokemon, Who Appear On The Screen As If They Were In The Same Real-World Location As The Player.Our Website MMOVIP.COM Offers The Cheapest Pokemon GO Accounts Over The World Now. Just Choose The Level You Want To Buy. 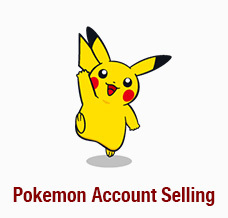 All Pokemon Accounts With Random Pokemons And Startdust, It Enables You To Enter The Fantastic World Of Pokemon GO With Absolute Top Preconditions.If You Have Ever Considered About Buying A Pokemon Go Account For Sale That Is Already Stacked With Every Pokeball And Items In The Game. Then Don't Hesitate To Come To MMOVIP.COM , Here You Can Get Cheap Pokemon Go Account And Cheap Pokemon Go Power Leveling.